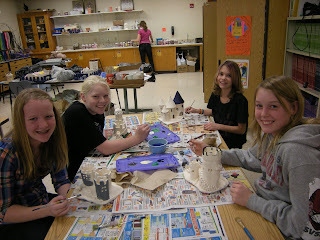 This project was a continuation of our Medieval unit. I had never done these before. . . not sure I will again. These took a lot of time. 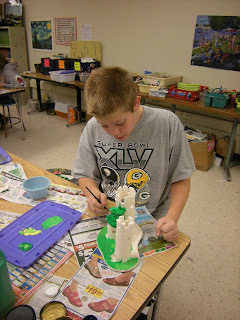 We first made our castles in paper so that we would have templates to trace onto our slabs. Then students rolled and rolled slabs. Then we had to get them to be the right moisture content to stand. Hmmm. Students are painting them now and finding it difficult to get into all the little nooks and crannies. I bought spray paint tonight and I am going to take them outside and go for it!! I will post our results later. This is something I always wanted to try. 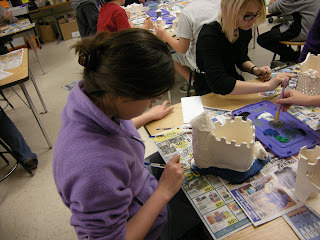 Next time I would give students more structure. Each student was given a bin to put their work in (dollar tree :) ) Their base had to fit inside the base. This project took a lot of clay! Whew! I did clay mugs with the other 2 classes and I am happier with those results. We shall see . . .